There are 9 essential elements of what I call “the perfect blog post” and each element serves a specific purpose. It’s a revolutionary idea, and you’ll LOVE IT. 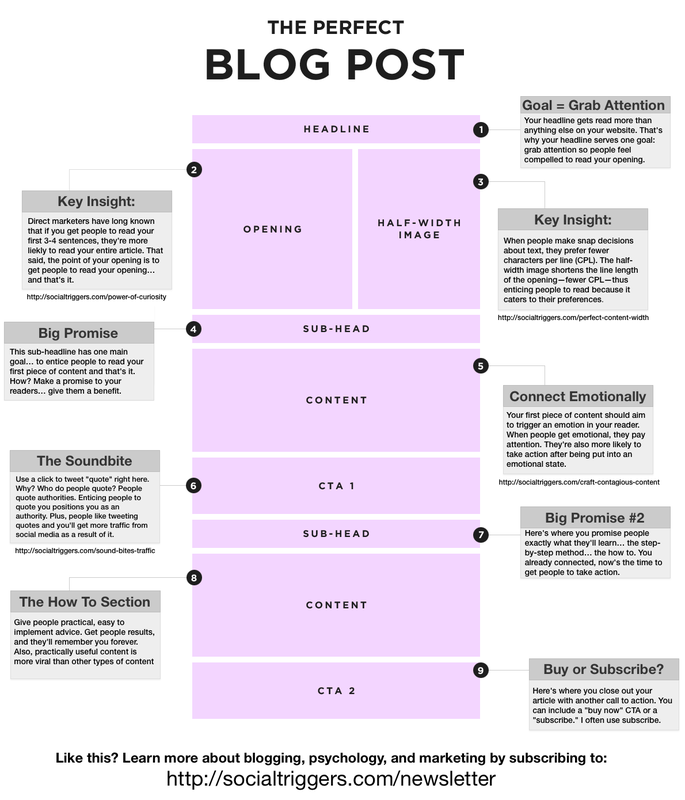 What is the perfect blog post… and how can you create it? Well, if you’re using Thesis and WordPress, it’s EASY, and right now I’m going to show you exactly how to do it. Before I take you through the steps for creating the perfect blog post from a technical standpoint, you’ve got to know what you’re creating, right? Some of this is as easy as including some html in your blog post, whereas the final piece, the call to action at the bottom of the blog post, will require you to mess with some code (but don’t worry, it’s easy and we’ve got a tutorial for it). There are 9 components, 4 of which require some technical know-how. Some of it is as easy as a few html tags, others require a few more steps. No worries though, it’s easy! While I call it the half-width image, I don’t actually use 50% width. In reality, I use around 33% width. So, for example, if your content column is 600 pixels, I’d use an image that’s around 200-250 pixels wide. The key part of this is the class=. I know this likely goes without saying for a lot of you, but surprisingly enough, there were some people who did not know what I meant by sub-head. So, as a quick refresher, a sub-head is a sub-heading. To create that, all you need to use is the <h3></h3> HTML tags. Simply surround your text in the h3 tags and you’ll be set. Sub-head created! People LOVE to share quotes on Twitter. When you give them a quote to share, you’re giving them exactly what they want to share. My friend Pat Flynn (and fellow Thesis user) tested out this soundbite method, and he noticed that 800 people clicked his “click to tweet” link. When I’ve used it, I’ve had similar results, too. For example, in one article, I put a simple quote below my video “You don’t have to be interesting to not be boring” and loads of people shared that on Twitter too. Now as you’ll notice that I use the soundbite inside of a yellow box. To create the yellow box, all you have to do is add class="alert" to your paragraph tag. Why does that happen? Well, in Thesis, “alert” is a default tag that creates that little yellow box. If you don’t want the yellow box, you can use class="note" for a gray box. Now, the question is, how do you create that little Click to Tweet Link? You have two options. You can use a website that creates the Click to Tweet link for you, or you can create it by hand. Quite frankly, I recommend you create it by hand because if you use the website, and that website disappears, all of your click to tweet links will become broken, and that can become a major headache. But you can’t just type it any format.. Since you’re constructing a URL, you’ve got to encode the symbols so that your browser knows to add the correct symbols into your tweet. For the purposes of a URL, you’ll need to encode both your / (back slash), : (colon), and your spaces between words. How do you encode the colon, back slash, and spaces? Then, when you’re constructing your tweet, all you have to do is take your regular tweet and replace that. Then, you’d simply add that after the text= portion of the url. Then, you’d simply create a normal link in your WordPress editor, and link to the above URL as you just constructed. It looks a lot more complicated than it really is, trust me ;-). There’s a website called ClicktoTweet.com that makes creating these links MUCH easier, but the problem is, it creates a short URL. Whatever you do, don’t use that short url that they create for you. Instead, add that short url into your URL bar and grab the link to the twitter url that it redirects you to. See how you type your text into the website there? Then, take the link it creates for you, and add it into your url bar… and load the website. Then you’ll see that it redirects you to a ready-made Twitter link that you can use in your blog post. Don’t use the ClicktoTweet url. Instead, use the URL that it redirects to when creating your link. That’s a bit easier to stomach than creating the URLs, but again, once you get the hang of making the URLs, it gets easy. Trust me :-). Why do I LOVE a call to action at the bottom of a blog post? If people read an entire article on your site, they often look for what they can do next, right? Now you could place any kind of call to action here… like a link to a landing page… or what I prefer to do (as you can see here on DIYthemes and on Social Triggers) is add an opt-in form because it converts well. Remember, one of the best ways to build your business AND blog is by building your email list. Question is, how can you add an opt-in form at the bottom of your blog posts? The point of this blog post is to encourage people to read the blog post in its entirety while also encouraging people to share it on social media and subscribe to a newsletter. Will you start using this format?